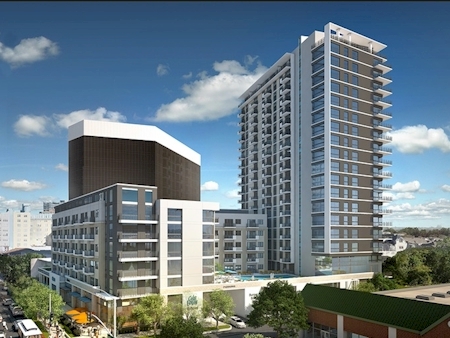 From the September 24, 2014 Dallas News: High Street Residential, the residential subsidiary of Trammell Crow Company, announces plans to build a 20-story, 271 unit, Class A residential tower at 3230 McKinney Avenue, currently the site of a 5,500 square foot Café Express. Along with residential units, the building will feature approximately 13,000 square feet of ground floor retail that will anchored by a new Café Express. The building will be located across Bowen from the McKinney Avenue Transit Authority (MATA) trolley barn and headquarters. High Street Residential/Trammell Crow Company is dedicating the southwest corner of the ground floor to house a new trolley barn, MATA museum and office space. A later article indicated 262 units would be included. Other Amenities: Street-level access to Café Express & Blue Sushi Sake Grill. Resident sky lounge located at the top of the building. Professional business center and conference center with personal study rooms.